Check engine oil level only after engine has been stopped for at least two to five minutes to allow oil to drain down. The space between the “FULL” mark and bottom mark on oil gauge rod represents 2 quarts. See figure 1-2. 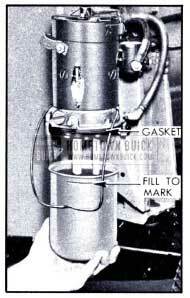 The oil level should be maintained between the “FULL” and bottom marks on gauge rod. It is best to maintain the oil level within one quart of the “FULL” mark. Do not fill above the “FULL” mark. 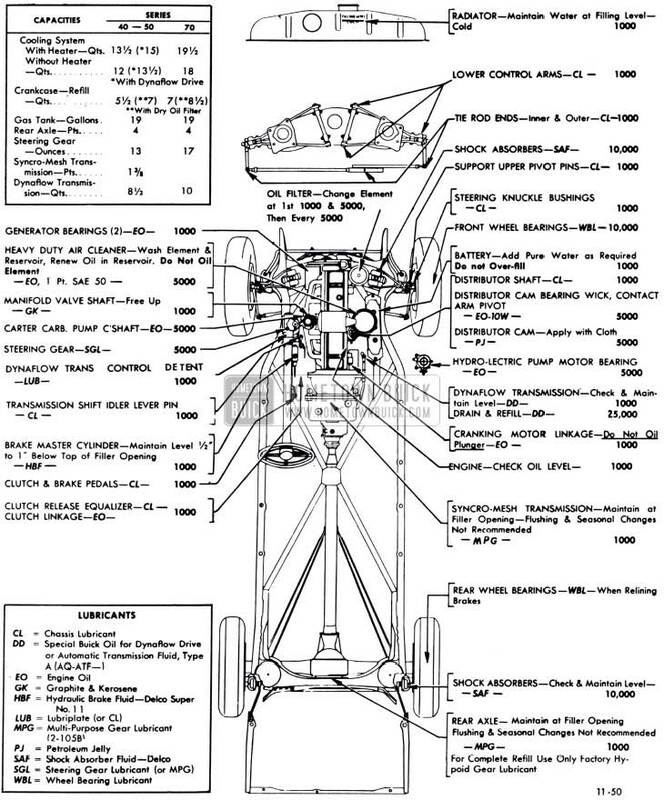 Synchromesh Transmission. Check oil level, after allowing time for oil to settle. Clean the surrounding area before removing filler plug. Level should be maintained at filler plug opening by adding Multi-Purpose Gear Lubricant (U.S. Army Spec. 2-105B). Use SAE 90 for temperatures not lower than 10° F below zero; for temperatures continuously lower than -10°F use SAE 80. NOTE: Draining and flushing transmission is not necessary at any time unless the lubricant has become contaminated. Rear Axle. Check oil level, after allowing time for oil to settle. Clean the surrounding area before removing filler plug. Level should be maintained at filler plug opening by adding SAE 90 Multi-Purpose Gear Lubricant (U. S. Army Spec. 2-105B). NOTE: Draining and flushing is not necessary at any time unless the lubricant has become contaminated. When complete refilling is required use only Factory Hypoid Lubricant as specified in paragraph 1-8. Dynaflow Transmission. Check transmission oil level, with transmission oil warm, transmission in Parking, and engine idling. 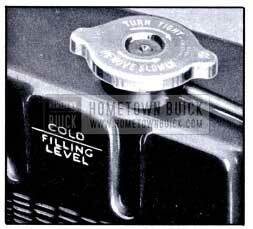 Remove gauge rod located under right side of hood (fig. 1-3), wipe dry with clean cloth then reinstall to full depth. Remove rod and note oil level. Cranking Motor (Starter). 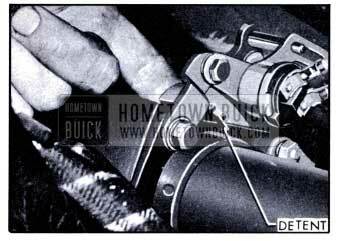 Apply a few drops of engine oil to the solenoid link pin and to the bearing between shift lever and stud. Do not oil solenoid plunger. Lubricate shaft with chassis lubricant through fitting on housing; the proper amount of lubricant is indicated by lubricant emerging from relief hole in front of distributor housing in a continuous unbroken stream. See figure 1-4. Add distilled water to bring level to ledge at bottom of slot in well. See figure 1-5. WARNING: Do not over fill. Air Cleaner. Normally serviced every 5000 miles. If car is operating in dusty territory, however, check conditions of air cleaner and clean it if dirty. See instructions in paragraph 1-2. Check coolant level when engine is cold and add water to line marked “Filling Level-Cold” stamped on rear side of head tank. See figure 1-6. CAUTION: Radiator cap should not be removed when engine is hot because relieving the pressure may cause the cooling system to boil, with resultant loss of water or anti-freeze solution. Filling radiator when hot, or filling above level line may result in loss of water or anti-freeze solution through overflow pipe. Generator and Fan Belt. 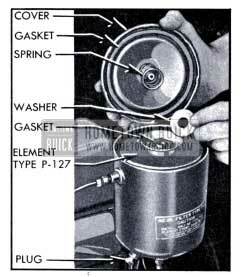 Place 2 or 3 drops of engine oil in cups at both ends of generator. Avoid excessive oiling which may affect brushes and windings. Manifold Valve Shaft. 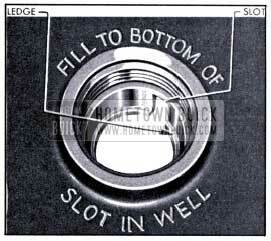 Place a few drops of graphited kerosene on shaft at each end and rotate shaft to work lubricant into bearings. See figure 1-7. If shaft is frozen, free up by tapping ends of shaft lightly with hammer. Throttle Control Linkage. Place a few drops of engine oil at connections. If the accelerator equalizer shaft squeaks in the upper and lower brackets, work Lubriplate or chassis lubricant into the bearings and wipe off excess lubricant. Control Detent-Dynaflow Drive. Apply a small amount of Lubriplate or chassis lubricant to notches of control detent at base of steering column. See figure 1-8. Brake Master Cylinder. Thoroughly clean filler cap nut before removal to avoid getting dirt into reservoir. Add fluid as required to bring level to 1/2″ to 1″ below top of filler opening. Use G.M. or Delco Super No. 11 Hydraulic Brake Fluid. Never use reclaimed fluid or any mineral oil. 24 lbs. Starting Pressure-after car has been standing for 3 hours or driven less than one mile. In temperatures below freezing, inflate tires 2 lbs. higher. WARNING: It is impossible to inflate tires correctly when HOT. Pressure normally increases as tires heat up when driving. Do not deflate tires to offset this increase in pressure. Hood Fastener Mechanism. Lightly coat hinge pilot pins and fastener hooks with Lubriplate or chassis lubricant. Door Locks and Strikers. Heavy bodied lubricants tend to gum up and hinder free movement of the lift bolt type locks. 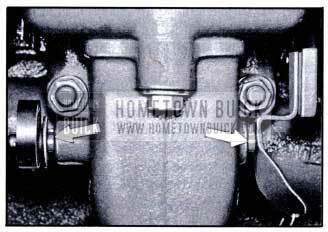 Referring to figure 1-9, use only SAE 10 engine oil at (1) roller and bolt (2) edges of bolt slot (3) (4) guide channels in striker ( 5) surface of bumper. Apply light film, wipe off surplus. Apply solution type graphite lubricant where bumper bears against striker plate at (6). Door Checks and Hinges. 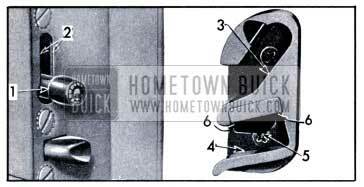 On Series 40, apply Lubriplate or chassis lubricant to hold open springs in front door hinges. Use same lubricant sparingly on lugs of all rear door check links. On Series 50-70 apply light engine oil to check link pins. No lubricant required on hinge pins. Wind shield Wiper Cables. Wipe a few drops of light engine oil on cables where they pass over tensioner pulleys. CAUTION: Windshield wiper blades must not be rotated by hand for any reason as this places an undue strain on cable fastenings. Rubber parts such as door weatherstrips, cowl ledge lacing, stabilizer bushings, etc., do not require Lubricare unless they are causing squeaks. 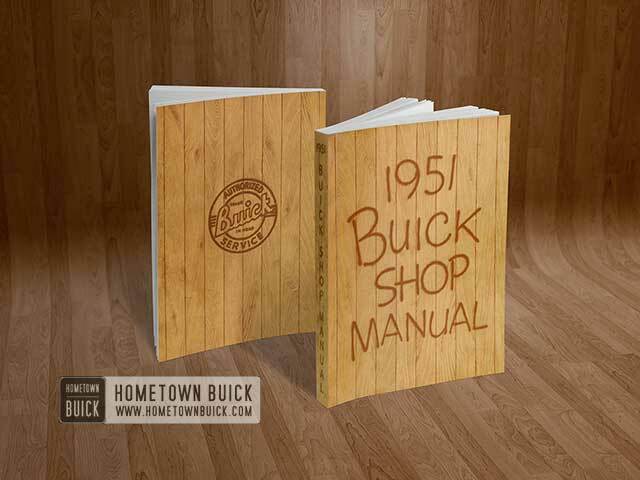 If 1951 Buick Lubricare becomes necessary, make certain that the lubricant used is not injurious to rubber. Where the lubricant can be spread on the rubber part use Lubriplate or white vaseline. Where a penetrating liquid lubricant is required use G. M. RuGlyde (Group 8.786). Air Cleaner. Every 5000 miles (more often under dusty operating conditions) remove and wash oil sump and cleaner element in a noninflammable solvent. DO NOT USE KEROSENE. Wipe sump dry and allow element to drain until dry. Do not use air blast on cleaner element. Fill sump to point marked “OIL LEVEL,” using one pint of SAE 50 engine oil. See figure 1-10. Do not oil cleaner element because oil will drain down into sump and cause sump to be overfull. Make sure that gasket in center of element is in good condition then install element and sump. Wipe all oil from outer surface of cleaner. Oil Filter. Change original filter at first 1000 miles, the second element at first 5000 miles, then change element at each 5000 miles interval thereafter. Remove old element, remove drain plug, and thoroughly wipe out container with CLEAN cloths. Install drain plug, new element and new cover gasket. See figure 1-11. 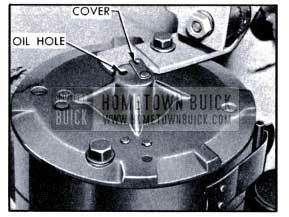 Use only Buick Oil Filter Replacement Element, Part No. 5572129 (AC Type P 127). 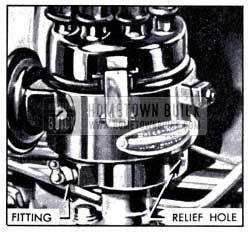 Pump Operating Countershaft-Carter Carburetor Only. Remove the 2 dust cover attaching screws, apply several drops of engine oil in screw holes above the countershaft, and install screws. See figure 1-12. 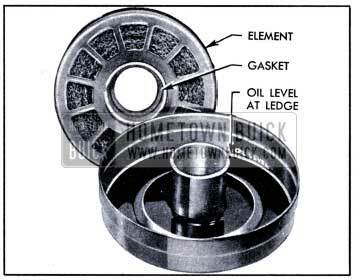 Swing the oil hole cover aside on upper end of motor and lubricate upper bearing with a few drops of engine oil. See figure 1-13. Front Wheel Bearings. Inspect, repack, and adjust front wheel bearings as described in paragraph 6-14. At 25,000 mile intervals the oil pan and torque converter should be completely drained and refilled with fresh oil. Transmission MUST NOT BE FLUSHED when oil is changed. Warm up transmission, then remove bell housing cover. Loosen one converter drain plug, through opening in flywheel, then turn flywheel until opposite drain plug is straight down and remove this plug to allow converter to drain completely. See figure 1-14. Remove drain plug and allow oil pan to drain completely. Do not remove accumulator Caps. See figure 1-14. Put 3 quarts of specified oil (subpar. a) in transmission. 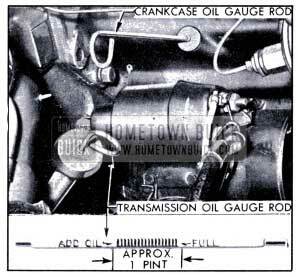 With engine idling and transmission in Parking (P) complete the refilling to bring oil level to 1 3/4″ below “FULL” mark on gauge rod. When transmission oil is warmed up, the oil level should then be at “FULL” mark on gauge rod. Each Fall all windows should be lowered, the seat moved back and the reservoir on the power unit removed, cleaned out with Declene or alcohol and then refilled with G. M. or Delco Super No. 11 Brake Fluid. Brake fluid heavier than No. 11should not be used in extremely cold climates as it will cause sluggish operation of the Hydro-Lectric system. See figure 1-15. The Lubricare information in this paragraph is not required for general maintenance of the car but is given here to provide complete information on Lubricare. Lubrication of parking brake cables is also performed during the major brake adjustment; however, operation under conditions where mud and water are frequently encountered may require more frequent lubrication. See paragraph 8-14. The speedometer cable is factory lubricated with special all-season grease and normally requires no further service unless it becomes noisy. In extremely hot climates or where considerable_ dirt and water are encountered, however, it may be necessary to lubricate the cable at intervals of approximately 20,000 miles or every two years. See paragraph 10-68. If the sunshade rod turns hard in the support as sunshade is moved up and down, remove retainer screw, pull rod from support and apply G. M. Door-Ease Lubricant. Do not use oil, which may soil body trim. Install rod in support and adjust retainer screw to proper tension. Brand of Oil. In the selection of the proper brand of oil it is essential to consider the reputation of the refiner or marketer. It is imperative that the same brand of oil be used at all times. Type of Oil. There are several types of oil manufactured for use in internal combustion engines. 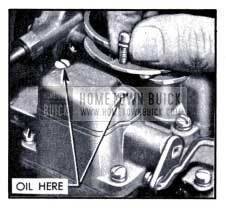 For use in the Buick engine we recommend that a Heavy-Duty Type Oil be used for maximum protection under all driving conditions. If Heavy-Duty Oils are not available Premium Type Oils may be used. 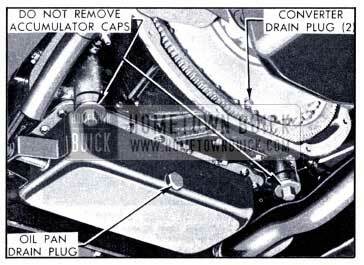 The use of so-called Regular Type Oils is not recommended in any series Buick engine. *If 5-W is not avalaible use 10-W plus 10% kerosene. Break-in Oils. Break-in oils or compounds are not necessary in Buick engines and their use is not recommended. Some of these break-in oils contain certain materials which may be harmful. The crankcase should be completely drained and refilled with new oil of proper viscosity at the end of the first 1,000 miles and every 2,000 to 3,000 miles thereafter. Adverse driving conditions may require more frequent draining and refilling. Adverse driving conditions are those which may cause early contamination of engine oil, such as operation under unusual dust conditions or short runs with a cold engine in very cold weather. Flushing the crankcase with oils or solutions other than a good grade of 10-W engine oil is not recommended. When flushing to remove contamination appears advisable, use 3 quarts 10-W oil (4 qts. if filter is drained) and idle the engine at 1000 RPM (equivalent to 20 MPH) until the oil is hot, then drain crankcase and oil filter immediately after stopping engine. Fill crankcase with correct quantity and seasonal grade of oil. When adding lubricant to bring it to proper level Factory Hypoid Gear Lubricant is preferred; however, SAE 90 Multi-Purpose Gear Lubricant conforming to and approved under U. S. Army Specification 2-105 B may be used. With rear axle jacked up so that wheels are clear of the floor, clean bottom of body, rear end of chassis and the rear axle housing to remove loose dirt which might get into rear axle when housing cover is removed. DO NOT TAKE CHANCES ON GETTING ABRASIVE SUBSTANCES INTO AXLE HOUSING OR BEARINGS.